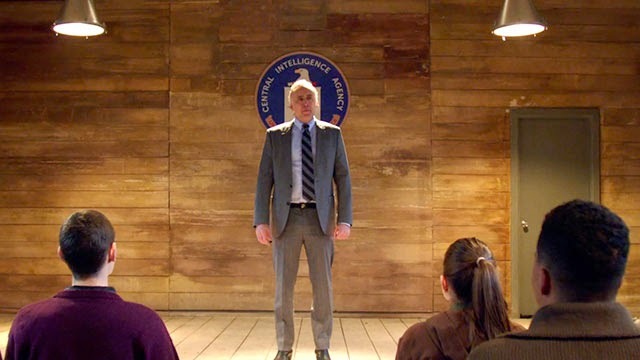 Evan Lake is the CIA’s top motivational speaker. He also happens to be played by Nicolas Cage, so hold on tight, this will be a bumpy ride. While a station chief, Lake was captured and tortured by a notorious terrorist, but he lived to tell the tale, with honor. Fatefully, just as the physical and mental symptoms of a rare neurological disease start plaguing Lake, he gets a line on his old tormentor, Muhammad Banir. 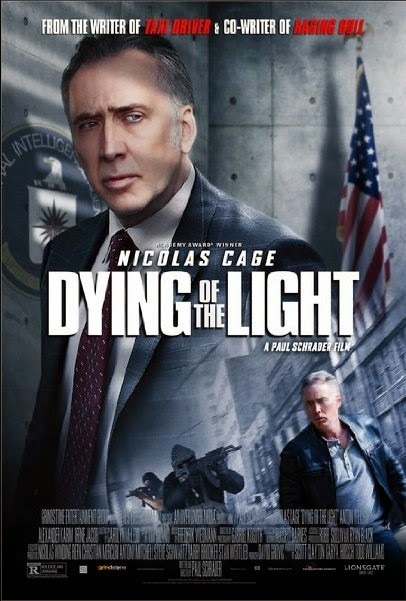 He might as well get his revenge or die trying in Paul Schrader’s Dying of the Light (trailer here)—although Schrader himself would reportedly prefer not to be so closely identified with the final producer-cut product. Regardless, it opens this Friday in New York. Every year Lake gives a pep talk to the new recruits undergoing basic training and he projects to the back row of the theater—the theater next door. This might be his last hurrah. The agency just got wind his second opinion came back positive (in a bad way). However, his protégé, Milton Schultz has some interesting news. The rare pharmaceutical used to treat Banir’s degenerative disease has strangely surfaced during an incident in Romania. Yes, both men are slowly dying, betrayed by their own bodies. Since the Agency still insists Banir is dead, Lake goes rogue, burning every possible bridge behind him. Yet, despite his increasingly erratic and anti-social behavior, he can count on the help of the loyal Schultz and Michelle Zuberain, an ambiguously close former Euro colleague. Meanwhile, the dastardly CIA bureaucrats keep trying to send Lake doctors and counselors. Be that as it may, Cage sure does his thing as the tightly wound Lake. The man just doesn’t seem to have an inside voice. When he gorges on scenery, it is like watching a bull in a china shop, but at least he is nowhere near as embarrassing as Meryl Streep unconscionably overacting in Osage County. As Schultz, Anton Yelchin looks thoroughly freaked out, probably because he was. At least Irène Jacob does her best to class-up the joint as Zuberain. Dying wrings plenty of atmosphere out of its Romanian locales and surprisingly, it is almost sympathetic in its treatment of the CIA (perhaps that is why some principals are unhappy). Say what you will, but they are dashed indulgent of Lake. In its current state, the film also portrays the Islamist terrorists as unambiguously vicious extremists. It is far from perfect and nobody would describe it as high art, but Dying of the Light is compulsively watchable, building a fair degree of suspense in its weird way. Recommended for fans of Cage’s flaring nostrils, it opens this Friday (12/5) in New York, at the AMC Empire.